A tropical disturbance is southwest of the coast of Mexico and is moving away from the mainland. It appears that there is enough rotation and organization to classify this as the newest tropical depression in the eastern north pacific. As of 8:00 am edt / 5:00 am pdt the tropical disturbance was centered near 14°N / 107°W or about 440 miles southwest of Zihuatanejo, Mexico. Movement is to the west at about 15 mph. Top sustatined winds are estimated at 30 mph. The tropical disturbance has been officially classified by the hurricane center. During the day, visible satellite imagery shows that the low pressure center is not as quite as well defined as earlier. The low level center is more diffuse with little deep convection near it. It appears that easterly shear is keeping the deep convection west of the center. If this persists the low pressure system may never reach tropical storm strength per the national hurricane center forecast. 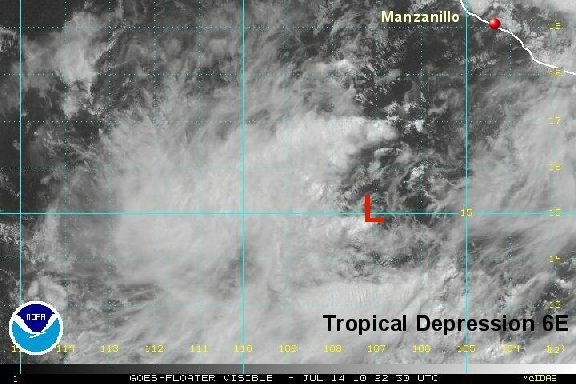 As of 7:00 pm edt / 4:00 pm pdt the tropical depression was centered near 15.2° N / 107.4° W or about 330 miles southwest of Manzanillo, Mexico. Movement is to the west northwest at about 13 mph. Top sustatined winds are estimated at 30 mph (NHC 35 mph). This tropical depression is not a threat to Mexico, so updates will not be as frequent. 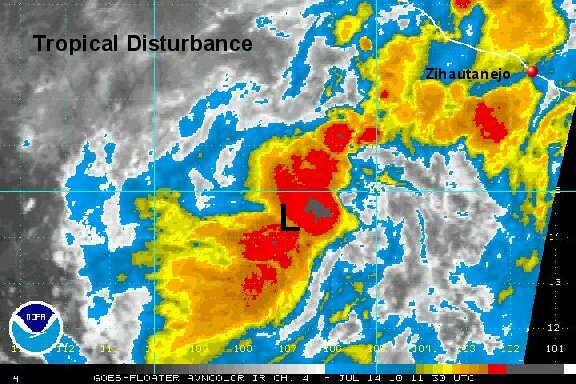 The tropical depression has gained some convection overnight. Winds aloft are still strong from the east, so it will struggle to make storm strength. The winds should weaken in the next 1-2 days, so there may be an opportunity for some development before moving into cooler water. 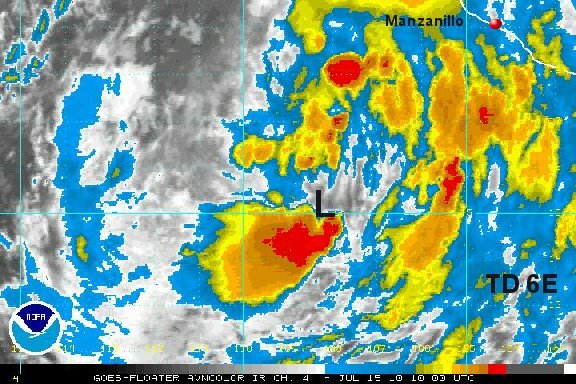 As of 7:00 am edt / 4:00 am pdt the tropical depression was centered near 15.2° N / 108.4° W or about 380 miles southwest of Manzanillo, Mexico. Movement is to the west northwest at about 10 mph. Top sustatined winds are estimated at 30 mph (NHC 35 mph). Tropical depression 6E is still a broad low level center. Convection is not concentrated and winds aloft are still hostile for development. NHC is still calling for this to become a tropical storm by tomorrow morning. 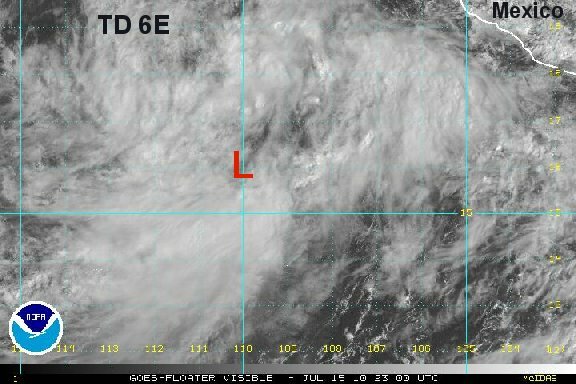 At this rate, tropical depression 6E is losing its opportunity for development before moving over cooler water. Our position estimate is a bit different from the hurricane center's also. No wonder with how diffuse the center of circulation is. 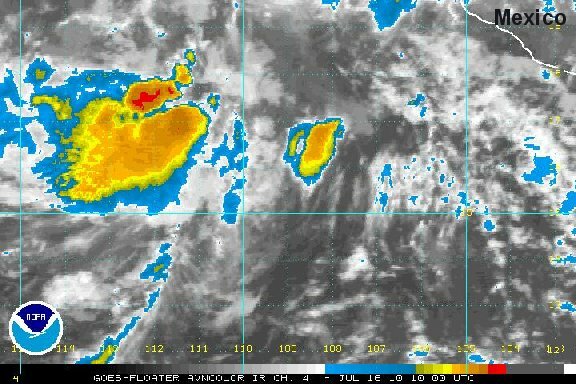 As of 8:00 pm edt / 5:00 pm pdt the tropical depression 6E was centered near 16.4° N / 110.3° W or about 450 miles south of Cabo San Lucas, Mexico. Movement is to the west northwest at about 10 mph. Top sustatined winds are estimated at 30 mph (NHC 35 mph). The hurricane center has written its last advisory on tropical depression 6E as it remains disorganized. They are no longer calling for it to become a tropical storm - agreeing with our assessment yesterday. This will be the last advisory on 6E unless regeneration occurs. It looks like a cloud feature is still actually still 6E well west of Mexico. Satellite imagery shows rotation with a little convection. It probably has finally moved away from the upper wind shear. It is moving into cooler water and should weaken anyhow.